A lot less pricey than most systems on the market. Uses this bluetooth system to talk directly to your students. 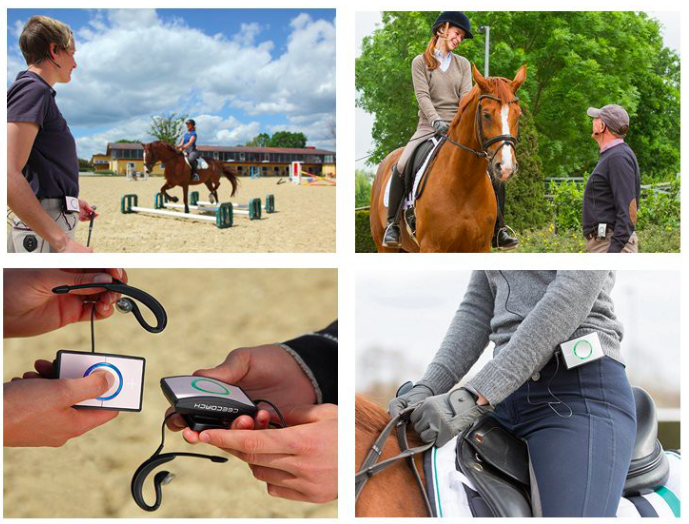 With the CEECOACH® Communication System, a trainer can communicate with 1 to 5 riders using Bluetooth® technology for a stable, secure connection without a cell phone network. User - friendly system allows simultaneous speaking between participants with excellent voice and audio quality. The lightweight, rugged and weather - resistant units are simple to use, even in gloves. Features a range of over 1600 feet and 10 hours of battery life. Includes 2 clip - on units with headsets, cables, power supply. You can purchase it at Dressage Extensions by clicking here. As they say, one picture (or drawing) is worth a thousand words. Use this drawn-to-scale dry erase whiteboard to draw the figure that you want your student to ride. When they make mistakes (ovals rather than circles, incorrectly shaped serpentines, early or late transitions), show them what they're doing wrong on the board. This board is small enough to fit into a back pocket or jacket pocket. It has a drawn-to-scale full dressage arena on the front and a drawn-to-scale small arena on the back. Other styles are large. Click here to see the styles available, and to make a purchase. If you have multiple horses in training, but prefer to ride your own saddle and girth, this is a must. Using the same girth on multiple horses is a good way to spread infections or bacteria through your barn. Keep a bunch of these in the barn, and slip one on the girth before saddling a horse. When you're done training that horse, just slip it off. Completely machine washable. Fits over any size girth (long jumping saddle girths or short dressage girths). Click on the picture to purchase from Amazon.com. Nice quality letter towers are nice quality are readily visible from a distance. The Berkshire Line of letters breaks the tradition of the three sided Burlingham Sports Elite and Tower Letters, introducing square letters in two sizes. The Berkshire Dressage Letters are silk screened on all four sides. For high wind areas we designed the Berkshire Bottom Plate. Fill the cone with sand slide the bottom plate on and your letters will stay put. Dressage Cones Sturdy, durable bright white PVC plastic with high contrast black letters. Lettering is on one side only. Two holes tapped into the base of each cone allow the plastic cone to be mounted on a board for greater stability. (A, B, C, E, F, H, K, M) Easy to use markers to mark a small dressage arena. Large black letter stand out against white cones. Purchase the add-on Set of 4 (below) to make it a complete set for a large arena. (R, S, V, P) Add-on set to the Ovation Dressage Cones-Set of 8, to turn your small arena into a large arena. Large black letter stand out against white cones. At the push of a foot, the Quick Cavaletti will help you through numerous exercises. With heights from 6, 8, 10 and 12, you can even set a low grid or bounce workout. Sold in pairs, these Cavalettis will work beautifully with 4 Poles, 3 Poles and 3 x 3 4x4 Lumber. Measures 14" X 14" X 5". Weighs 4 lbs. each.